User experience is, at the core, what a human feels while engaging with a company's product or service. Good user experience engages users with multiple disciplines of design to allow a clear and pleasant process when using a product/service. Good UX pleasantly surprises people and creates an emotional connection between them and the product. Bad user experience confuses users and creates road blocks where none need to exist. It leaves a bad taste in a user's mouth that effects all other encounters they have with that product again. VZIBL is a mobile application that allows users to license and sell their creative photography to others. Goal 1: From beginning to end, create a way for photographers to upload their work and connect with their followers. Goal 2: Make it easy for users to find quality photos to license and purchase from their favorite photographers. 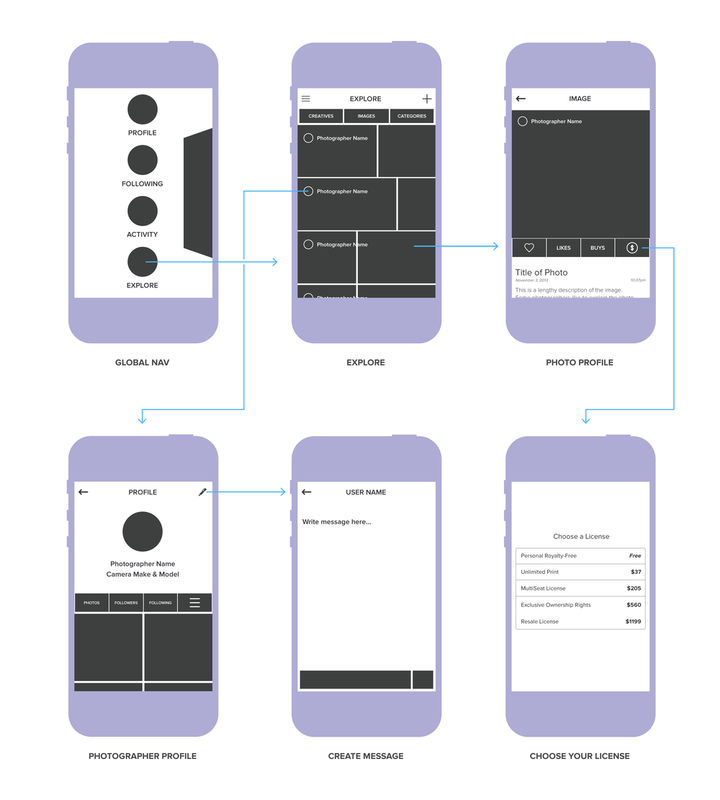 The initial user flow illustrates, in a general layout, the main flows of the app. The entry flow generalizes the entry point of the app, and if there's any specific information that is required before entering the app. The main app flow covers navigation, user interaction, and flushes out any major concerns that may arise from the app. The purchase flow begins with viewing the photo profile screen. This is where the user sees all of the details about the photo: number of likes, number of purchases, title, description, license formats, and the ability to purchase the photo. Tapping on the purchase button brings up a custom action sheet that allows the user to choose a specific license they'd like to purchase. The purchase flow includes choosing a license, confirm the purchase, payment method setup, and a thank you page that encourages the user to share their purchase details with the public. The explore screen contains three main tabs that allow users to view main content. The creatives tab contains photos by most popular photographers. The images tab contains photos that are populated by most recently popular. The categories tab contains categories that allow users to dig down into a specific genre. Tapping a photo brings up the photo profile screen. Tapping a photographer brings the user to that photographer's profile, where users can communicate with each other, or purchase other content they've created.